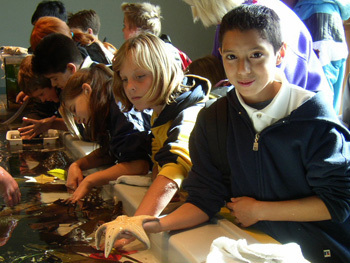 Visitors to the Seymour Center learn about marine life, scientific discoveries, and the role of science in marine conservation. The California Coastal Commission has awarded grants to fund two coastal restoration and education projects at UC Santa Cruz, one at the Arboretum and another at the Seymour Center at Long Marine Laboratory. The UCSC grants are among 23 awarded statewide in 2013 by the Coastal Commission's Whale Tail Grants Program, funded by sales of Whale Tail license plates. At the Arboretum, a $10,500 grant will fund a watershed restoration project along Moore Creek, which flows through the Arboretum on the UCSC campus and down to the ocean at Natural Bridges State Beach. The banks of the creek are home to threatened red-legged frogs and other animals, but highly invasive non-native plant species are spreading throughout the creek's watershed, according to Arboretum director Brett Hall. 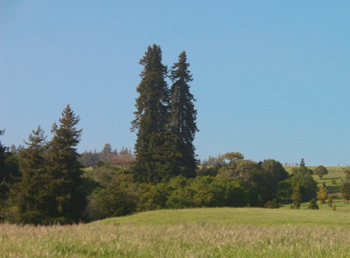 "We appreciate the Coastal Commission's support of our invasive weed removal program, which will improve habitat for frogs, birds, and bobcats while educating and involving UCSC students, Arboretum volunteers, and local K-12 students," said Stephen McCabe, director of research at the Arboretum. The Arboretum is planning to create a watershed restoration syllabus, with input from outside experts, that would compile the best protocols on removing invasive weeds and restoring native vegetation. Community members will be recruited to remove invasive plants several days each week and plant native grasses, sedges, rushes, perennials, and shrubs. Several thousand native plants are already being grown for this project, Hall said. At the Seymour Marine Discovery Center, a $9,370 grant will fund efforts to expand the center's capacity to serve Spanish-speaking audiences. The center will recruit 8 to 10 bilingual high-school and college students to volunteer as exhibit guides. In addition to the usual training on marine science and conservation, these volunteers will receive training for working with Spanish-speaking audiences and learn culturally relevant techniques for interpreting marine conservation. "This grant allows us to enhance our spring training for exhibit guides toward serving a broader community. Spanish-speaking guides will then be on shift every weekend during the summer," said Julie Barrett Heffington, director of the Seymour Center. The center is planning a festive multicultural day on June 8, World Oceans Day, to kick off the new program and attract the Spanish-speaking public to the Seymour Center. In addition, a brochure with ocean conservation tips in Spanish and English will be developed for distribution to visitors. The California Coastal Commission's Whale Tail grants support programs that teach California's children and the general public to value and take action to improve the health of the state's marine and coastal resources.